I am not a wedding planner. Neither am I close to becoming Martha Stewart. My knowledge of wedding only come from planning my own wedding, being once a bridesmaid and having been to countless wedding dinners. 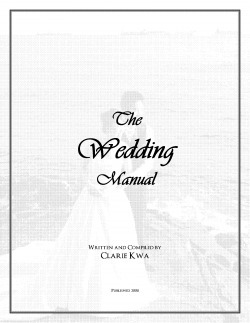 That still did not stop me from wanting to write this e-book "The Wedding Manual". In our journey to prepare for the wedding, my husband and I have been through joy, excitement, disappointments and even frustration at times. We also came across talents and mediocrity, top-notch and unbearable service, creativity and boredom. And I could not help thinking, how can we exercise our free will consciously in planning a wedding? Honestly, it is not a very comprehensive book. I don’t provide pricing details since the prices don’t stay static and hidden costs are pretty prevalent in this industry. But in this book, I help to guide your research. Instead of scrolling pages of forums, flipping countless bridal magazine, browsing bridal salons looking for a so-called best deal, being bombarded by both true and misleading information, well or ill intentions, consciousness or unconsciousness, my book directs you to the point of what pitfalls to look out for, what questions to ask yourself, what should guide you to make a decision. Lastly, this e-book is FREE. I just want to share, to let each and everyone of you have a glimpse of independence, freedom and self-expression in your journey to create the most beautiful event of your life. Download it here. Have a lovely read!